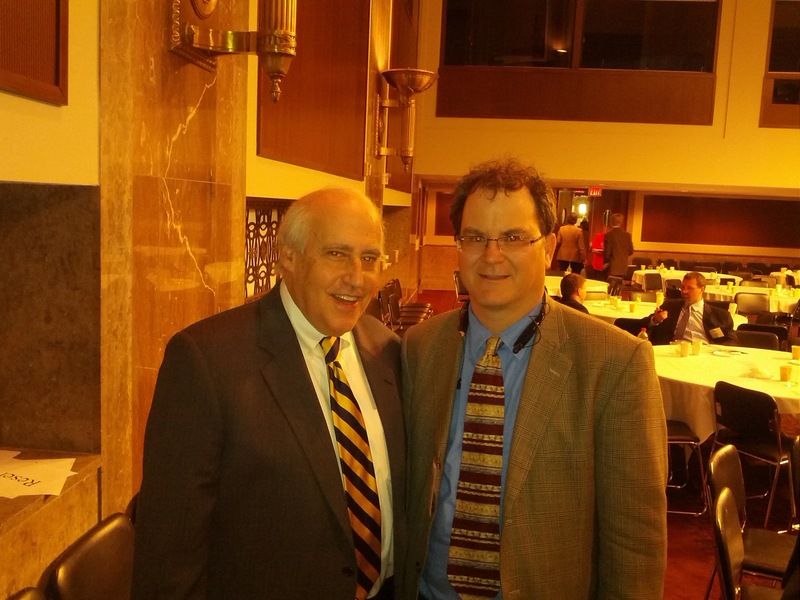 Our meeting with the Secretary of Agriculture Dan Glickman! 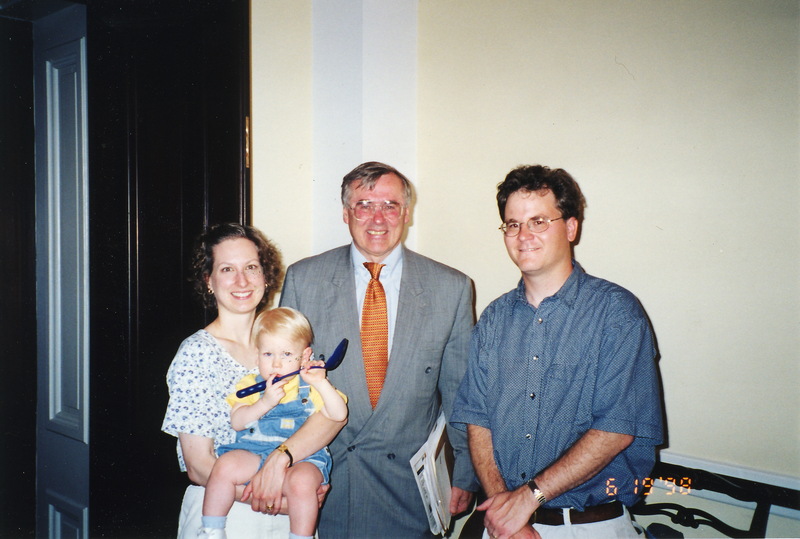 The following is another brief excerpt from my yet unpublished memoir, “Muckville: Farm Policy, Media and the Strange Oddities of Semi-Rural Life.” It deals with then Secretary of Agriculture Dan Glickman meeting with Eve and I in 1998 in the U.S. Capitol. But a few days after the press conference Rep. Gilman’s office called Eve and me and to tell us a meeting had been set with Secretary. 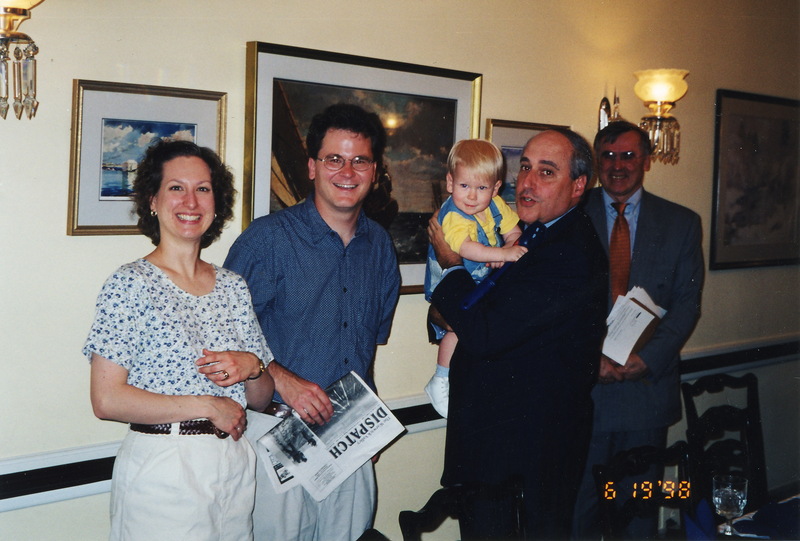 Glickman in the Capitol for Friday June 19th, 1998. They asked if Eve and I could come down to the meeting … we said “absolutely.” Ray Myruski was also invited to attend and he did as well. Eve and I drove down to Washington, D.C. with Caleb. Caleb was only about 14 months old and we were a bit worried about how he would do during all this. We had a pre-meeting scheduled in Representative. Gilman’s office and the meeting proper was to be held in the actual U.S. Capitol building. We came well prepared. Prior to the meeting Eve created detailed spreadsheets which fully demonstrated how poor the policies were, especially the buy-up policies. We also had the insurance documents which showed how our expected market price was set at the absurdly low figure of $4.85 per hundred weight in 1996 (the 5-year Olympic average (’93-’97) for onions in New York, according to the marketing year average price data, compiled by NASS, is $12.93 cwt., the 10-year olympic average (’88-’97) was $14.96 cwt). Since we were forced to obtain a USDA Emergency loan (EM) after 1996 we had the loan application documents with us. Those documents included materials on what our onion crop should be valued at and those loan documents used a figures of over $21.00 per hundred weight. We also brought with us all of the letters that we had either received directly from USDA officials or indirectly via Congressman Gilman’s office. All of this material would come into play during the meeting. 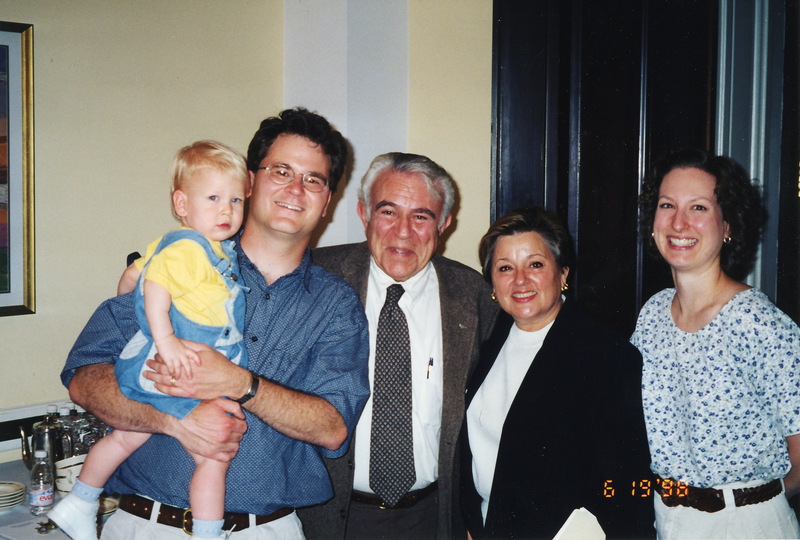 At the time of this meeting Representative Gilman was Chair of the House International Relations Committee. He had been serving on the committee (and its forerunner) for years, and had numerous knick- knacks and other such items all throughout his office. 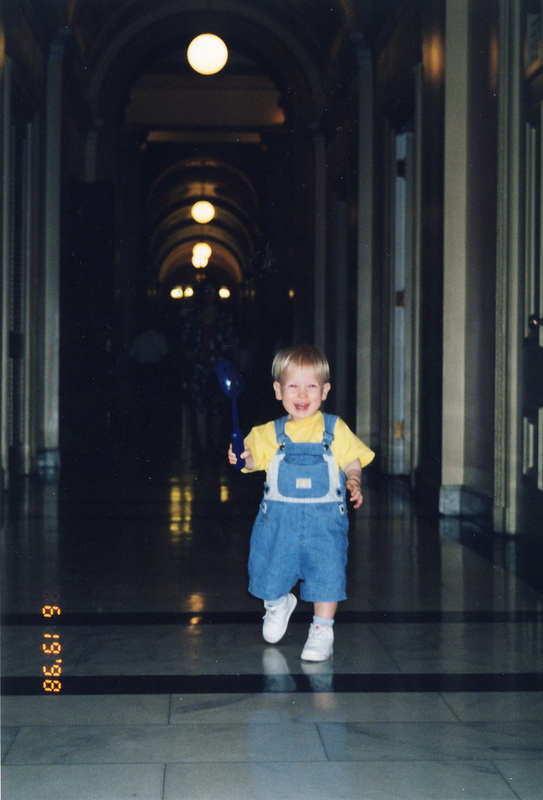 Caleb, who was a walking toddler, had a big blue cooking spoon which was at the time his favorite toy. During the pre-meeting in Gilman’s office Caleb began to walk about, happily swinging the big blue spoon wherever we went. 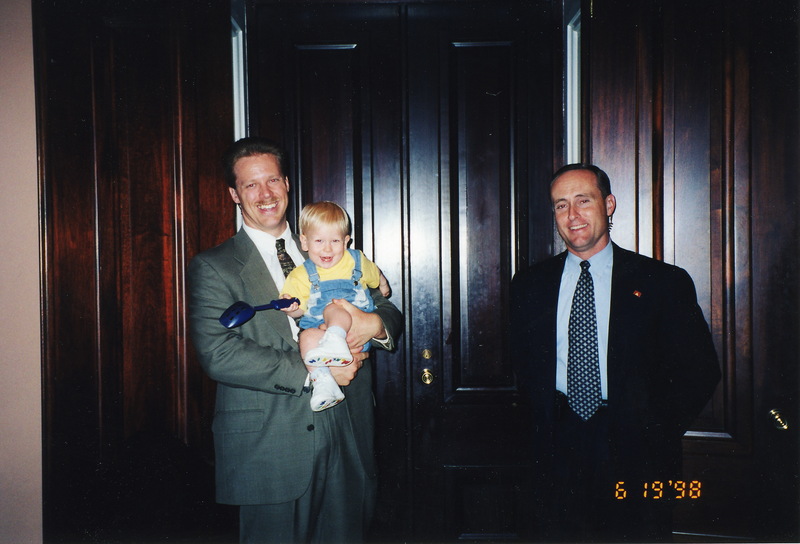 All Eve and I could think was “Oh my God … he is going to destroy some trinket given to the Congressman from the people of Botswana.” Gilman, and his staff, appeared to care less and thought Caleb was one of the best behaved children they had ever come across. Have I mentioned that Representative Gilman is one of the sweetest, nicest men on earth? After the meeting in Gilman’s office we all marched to the Capitol. The meeting was held in one of the large conference rooms. Because a member of the cabinet and a member of Congress was attending the meeting the doors were guarded by both a Secret Service agent and a plain clothes Capitol Police officer. At times during the meeting Caleb got fussy and Eve had to take him outside. We have some pretty funny pictures of him being held by the Secret Service agent and running down the hall with his big blue spoon. And there were others from USDA. Also in attendance was Senator Al D’Amato’s staffer Peter Phipps. The only people that spoke during this meeting were Eve and I, Representative Gilman, Secretary Glickman and Michael Hand. Eve and I knew of Hand but this was the first time we had met him in person. We now consider ourselves good friends. Eve and I had a nickname for him, “The Prince of Darkness.” He epitomized all the reasons as to why the federal crop insurance was so bad (farmers in Texas would refer to him, not so affectionately, as “Dr. No.” No matter what they asked him to do his response was always “NO NO NO!”). The meeting, though scheduled to be a half hour, went on for over an hour. As I said, if the June 6th press conference was my “coming out party” for the media, this meeting was my “coming out party” in terms of public policy advocacy. We talked about “Production to Count.” Eve said to Glickman, “Here’s the way to look at it, the policy subtracts from what it covers what it doesn’t cover.” I added, “it’s like this, if you get in a wreck with your car and your insurance company says, ‘oh, we can’t pay you anything because your other car is fine and its value wipes out your claim.’ And you respond, ‘but you don’t cover that other car’ and they respond with ‘too bad.’ That’s what is happening here.” Glickman had nothing to say. We touched on the absurd expected market price. We showed him how it was set at $4.85 per hundred weight in 1996, yet the same USDA in setting the value of our crop for loan purposes had a document in the EM loan packet that valued the crop at prices as high as $21.40 per hundred weight. And as I showed him those documents I said, “That’s a neat trick. For insurance purposes your USDA says are onions are worth $4.85 per l00 lbs but for loan purposes they are worth $21.00. Imagine if you walked in a car dealership and went to buy a car and they tell you for loan purposes it’s worth $50,000 but for insurance purposes it’s worth $5,000 … how would you feel about that?” He sort of mumbled something that he wouldn’t like it and I snapped “you’d have the person doing that arrested, wouldn’t you?” And he nodded his head in agreement. I said it sort of with a smile on my face. Glickman chuckled and nodded in agreement. The meeting ended back talking about how inappropriate it was for USDA officials to characterize CAT as free or cheap and it was the onion farmers’ own fault for their current predicament, because they didn’t buy what we all seemingly acknowledged was a worthless buy-up policy. Glickman seriously pronounced that “I assure you that from this day forward you won’t have USDA officials saying or implying that.” We happily shook hands and the proverbial “politician holding the baby” pictures were taken. Rep. Gilman’s wonderful wife gave me a big squeeze afterwards and said something like “you’re such a good boy” and “you did a great job.” We ended with promises to continue to work on this problem and fix it. 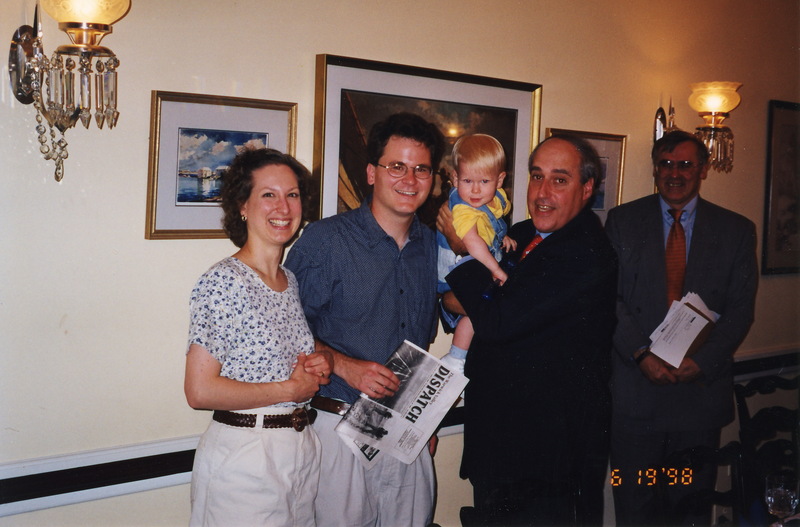 The lawsuit and my “Dan Glickman is the human safety net piece” never came up … though I had it with me. On the way home Eve and I wondered how long it would take for someone from the USDA to say “CAT was free or cheap” and blame us wrongly for being in the situation we were in. We didn’t think it would take a day or two. We were, sadly, wrong. Each Democratic Senator got to invite two individuals and I was one of 2 people that Senator Chuck Schumer chose. I was there representing the State, our community and our industry. Glickman was the keynote speaker so at the end of the event I waited in line to speak with him. When I got my chance the first thing I did was show him the picture of him holding Caleb back in 1998. When I showed him the picture he remembered and laughed. We chatted for a few minutes about that meeting and what happened afterwards. I briefly discussed the onion policy and how screwed up it was. We then parted ways. Back in 1998 we both had more hair, but my loss was more substantial.